March might be my least favorite month of the year (and thank heavens it’s over), but the long and cold month’s one saving grace here in New England is that it’s also maple season — that heavenly time of year when the sap flows and the sweet amber syrup is bottled. Pancakes, marinades, glazes, cakes, and cookies benefit from a boost of pure maple syrup, and if you’re one of those people who prefers Aunt Jemima or Log Cabin “pancake syrup” to the real stuff, never tell me. I want us to stay friends. 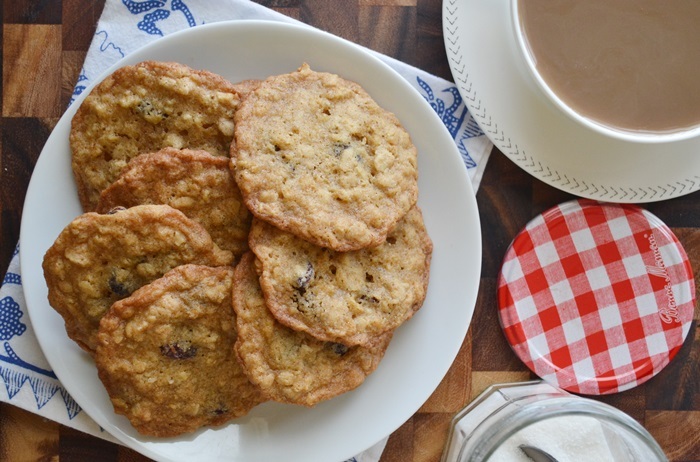 I’m not a huge cookie-eater, but when the occasional craving hits, I like my cookies buttery and crisp with an emphasis on things like dried fruit and nuts (chocolate has no power over me), so these crispy oatmeal raisin cookies flavored with maple syrup fit the bill quite nicely. 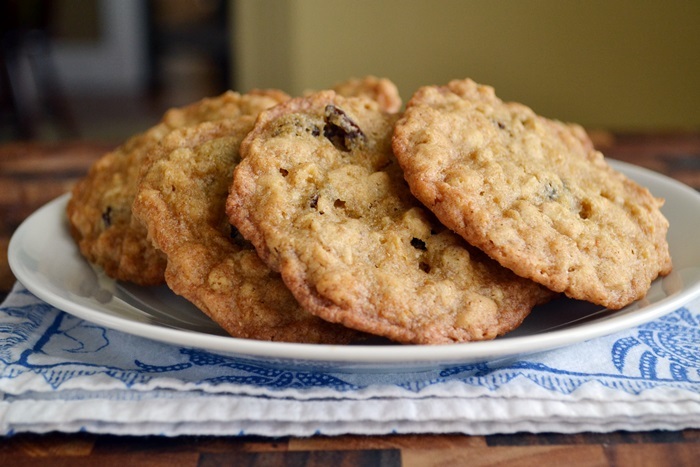 Crispy Maple Oatmeal Raisin Cookies. The recipe comes from one of my favorite modern New England Cookbooks — New England Home Cooking by Brooke Dojny (Harvard Common Press, 1999). I received this book back in the fall of 2011 (when I wrote about the Scottish Oat Waffles recipe), and I still pick it up all the time. I love a cookbook that tells a story along with providing recipes, and Brooke’s books (she’s got a few on New England!) are chock full of the anecdotal intros and sidebars I love so much. For example, I learned that this recipe was one she developed for a 1980’s Yankee Magazine-sponsored food festival, which was then included in a recipe booklet sent to the magazine’s subscribers. Naturally, since I work for Yankee, I tried to track down the booklet so I could make these for the magazine’s website, but when I couldn’t find it, I thought it might still be something my band of straggler Apron Archives folks might enjoy. Truly, these cookies are too good not to share, so here you go, and happy spring! In a large bowl, whisk together the oats, flour, baking soda, salt, cinnamon, and nutmeg. In another large bowl, cream together the butter, vegetable shortening, and sugars until smooth and fluffy. Add the eggs, maple syrup, and vanilla and continue to beat, stopping to scrape the sides of the bowl with a rubber spatula as necessary. On low speed, add the oat mixture one cup at a time, beating just until the dough comes together. Stir in the raisins by hand. Using a cookie scoop or tablespoon, drop the dough in rounded balls onto the prepared cookie sheets, spaced 2-inches apart. Dampen 2 fingertips with cold water and press lightly on each cookie to flatten slightly. Bake, rotating the cookie sheets halfway through, for 11-13 minutes or until the cookies are a light golden brown. Transfer to wire racks to cool completely.